Earlier this year I was asked to house sit for my friend while she was on holiday – I watered her garden on designated watering days, checked her mail, turned the light on and off now and then to make it look like someone was home etc etc. My friend told me that while she was away I could have unlimited access to her cookbook collection. This excited me because while I love buying cookbooks I have to limit myself because I don’t have much room in my unit and I realize that I don’t cook a lot from cookbooks. It was great to have access to someone else’s collection and spend some time going through their cookbooks and discovering new recipes. Rose tries to source as much local organic produce as possible for her food and wanted a restaurant that ranked vegetables above meat or fish, and to offer (if possible) healthier desserts and cakes, without compromising flavour and texture. The recipes in the book are simple to follow and Rose provides good guidance to help you obtain results but she also encourages a flexible approach to cooking and the substitution of ingredients. Rose works with the philosophy that “life is improved by great food and great good can be achieved by everyone”. I saw a recipe for pistachio cake and noted it down for future reference. I love eating pistachios. There is nothing better than snacking on a bag of pistachios. 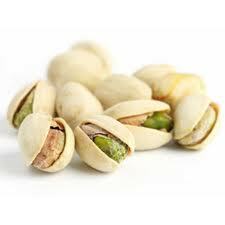 I think the fact that pistachios come with shells makes it even more satisfying to eat as you have to put in more effort to consume the nut – like it’s ‘playing hard to get’ with you. I recently made this cake for a dinner party at my place for a friend over from London. When I bake it’s always for an occasion otherwise I end up eating a whole cake by myself. Besides, the nature of baking means that you should show it off...I mean share it with friends and family. The pistachio cake was warmly received by my friends and it goes well with a cup of tea too. The pistachios give the cake a great flavour and also a lovely green colour. While I was making this cake I knew that it would turn out good because I tried the batter before I put it in the oven and I was impressed by the taste of it. I liked it so much that I ended up pretty much licking the bowl – it was that good! The other thing that I really liked about this cake was the texture. It was moist but not too dense, it was light, buttery and fluffy. I bought natural pistachios and blanched almonds with I roasted in the oven for 8-10 minutes and then ground with a blender. Butter a 25cm cake tin and line its base and sides with parchment paper. Beat the butter and sugar until they are very light and creamy. Mix in the lemon zest and vanilla extract. Add the eggs one at a time, beating well after each addition. Now fold in the ground almonds, ground pistachios, flour, baking powder and salt. Pour the mixture into the prepared tin and bake for about 40 - 50 minutes or until a knife inserted into the centre comes out clean. Remove from the oven and cool in the cake in the tin before taking it out. To make the topping, gently heat the pistachios, sugar, lemon zest and juice in a saucepan and pour over the cake. The cooking of the pistachios in sugar and lemon juice resulted in candied like pistachios for the top of the cake. Note: So I realized that after making this cake that I should have removed the brownish layer of skin on the pistachios by blanching the pistachios first in boiling water for 2-3 minutes. Drain and cool, and then rubbing the skins off while the nuts are still lukewarm. I don’t think it really makes any difference to the end product except that it would look better appearance wise. God i feel like cake now! I think the brown pistachios look carmelly and delicious particlarly with the lemony sugar glaze on them. I love a good pistachio cake. Thanks for the tips for remiving the skin! Thanks Ellie. This is the first time that I have used pistachios for baking. I want to bake more cakes using pistachios, they taste so good! Yum! What an elegant and unique cake! The crumb on this cake looks PERFECT. I have to write this in capitals because it is so true. I mean, because it is SO TRUE. thanks for the idea & recipe...just made it last weekend and it's all gone now...amazing flavor!